VERÓNICA: 28 years old. Diploma from Ambato High School with specialization in physics and mathematics. Studied Electronic Engineering at the Kennedy Campus of the Salesian Polytechnic University in Quito. TATIANA: 25 years old. Diploma with a specialization in physics and mathematics from the Manuela Cañizares Experimental Education Unit in Quito, graduating as the Second National Honor Guard. Studied Electronic Engineering and Control at the National Polytechnic School in Quito. Enjoys fabric painting, ceramics and marzipan art as well as learning languages and contemplating nature. As children, the Benalcázar sisters lived with their grandparents, Arturo Benalcázar and Rosa Gómez in Cotacachi in the province of Imbabura in the northern region of Ecuador. Their parents, who are engineers, have always been an inspiration to them. Their mother, Ayda Vayas, is a Zootecnic Engineer and their father, Luis Benalcázar, has a Master of Engineering degree and works in the maintenance of ophthalmology equipment. Their grandparents were definitely a source of inspiration with their sewing workshop and the grandfather’s mechanic and carpentry workshops which were his hobby and where Verónica and Tatiana discovered their liking for design and were able to repair or even create their own toys. They are very creative graphic designers, and they like to investigate and give life to their ideas. They are persevering and look for solutions to different problems by sharing their ideas. When life becomes difficult, they support each other, whether it is in a project or in any other situation. Their free time is dedicated to painting, sewing, knitting, crafts, designing and building autonomous robots and studying mathematics, physics, chemistry and biology. Their principal achievements are reflected in the international Infomatrix 2013 competition gold medal award, the Latin American Project Contest gold medal award, first place in 4 international robotic contests, and first place in 5 national robotic contests. Verónica and Tatiana, tell us briefly about the creation of the first national prototype for ocular surgery which was the experiment that won you the world championship prize in the category of Hardware Control at Infomatrix 2013 in Bucharest, Romania. It was our own idea (Tatiana and Verónica’s) to create our project with the objective of developing a very complex but practical project in order to show that we can develop technology in accord with the situation of our country and in this way leave a footprint so future generations can find financial support from public and private organizations since it has been very hard for us to get financial help from the competitions we have entered. In order to enter the international Infomatrix 2013 event, we started with the idea of creating the Vitrectomy Prototype Project at the end of 2011 and worked nearly a year on the project. We presented it to the Scientific Technological Community in our continent and won the gold medal and the 2013 International Accreditation as representatives of Latin America in the Hardware Control Category, giving us the right to enter the 2013 Infomatrix 11th Edition held in Bucharest, Romania from May 16 to 20, 2013. The Vitrectomy Prototype Project is used in eye surgery to clear vitreous opacities, remove blood, and treat infections and other diseases related to the jelly-like substance called vitreous that fills the ocular cavity. With the software and hardware we have designed, we (Tatiana and Verónica) control the entry of saline solution through the cannula infusion into the ocular cavity, the intensity of the optical fiber light (endoilluminator probe) that illuminates the eye cavity, and the instrument that makes a very small cut (vitrector) and removes the vitreous. We carried out research on the prototype for a year. We had to buy books on eye anatomy and vitrectomy surgery. We observed surgeries in operating rooms in order to understand the procedures and needs of ophthalmologists and be able to begin designing and creating the prototype with materials that would be easy to find while meeting ocular surgery requirements, so this was the first vitrectomy prototype produced in our country. What has becoming world champions in the Hardware Control Category of Infomatrix 2013 meant for you? It means that our efforts, work and dedication are reflected in this triumph for the entire country. It’s also the fulfillment of our dream to be able to show the world that we’re capable of carrying out technological innovation with the few resources that are available in our country. Tatiana: We’re very happy and proud to have represented Latin America and Ecuador in this international event where the best projects in the world were presented. 45 countries and 249 projects participated. We were the only representatives in this category from Latin America in the competition. We competed against the 10 finalists chosen from Azerbaijan, Bosnia and Herzegovina, Georgia, Malaysia, Romania, Turkey and Ukraine. This year, the silver medal was won by Bosnia and Herzegovina, and Ukraine. We were also very pleased because this year the judges awarded only one gold medal winner and it was for the research, creativity, difficulty, usefulness and originality of our Vitrectomy Prototype Project. 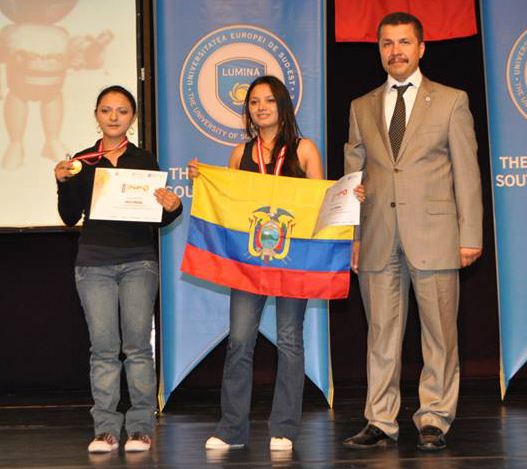 We’re very proud as Ecuadorians and even more as women to be able to represent our country in events of this type. The judges congratulated us for the Project, and they were surprised that with such low cost, easy-to-access materials and with the software and hardware we had designed and built, we had obtained such good results. We were the only two women competing in this category. We know that you have achieved a number of national and international prizes and awards for all the creative and meticulous work you have carried out with robotic and other types of experiments since you were very young. What you think has been the principal driving force that has inspired and encouraged you to explore and develop this interesting area of robotics and your inclination for research in general? The driving force that inspires us to create, design, develop and investigate is the desire to fight to make our dreams come true on a daily basis. That is what enriches all of us in our personal, family and professional lives. It means not limiting our imagination, because we can make our ideas take shape in creations that demonstrate our skills, abilities and knowledge. We understand that the family environment you grew up in contributed greatly to you being able to give free rein to your dreams and wishes and that now you’re focused on fulfilling them. Share with us briefly some of those unforgettable childhood experiences that have defined your lives in an extraordinary manner and have to some extent determined the successful future you are now beginning to experience. We remember that we’d design and make clothes, shoes and accessories for our dolls and we’d play with Legos, puzzles, modeling clay and marzipan when we were very small. My sister and I would use the scraps of fabric my grandmother didn’t need or we’d take little pieces of wood and nails and use the tools from my grandfather’s hobby workshop to make toys or adapt those we had to fit our needs or do anything that popped into our minds at the moment. Our parents gave us a hippopotamus that had a sound box inside that squeaked. We were curious about why it made that noise so we took it apart. Our parents were worried at first because they thought we had damaged the toy on purpose, but the next day we started putting it back together and tried to understand how it worked. When our parents and grandparents saw that it was working again, they were very happy that we were so creative and they encouraged us to continue creating things. This happened when Verónica was 6 and Tatiana was 3 years old. You are both worthy representatives of young people and most certainly examples of Young People of Excellence. What does a person need to NOT participate in mediocrity? What do you need in order to live as a young person of excellence, to live as spiritually, mentally and physically healthy young people who have the energy needed to fight for their dreams and use them to serve their community? In order not to participate in mediocrity, it’s important to maintain our identity and put our ideas and beliefs into practice in such a way as not to cause harm to our personal integrity or that of other persons in our midst. This means contributing to the growth of other people. It also means setting daily goals and carrying out our tasks the best we can. In order to attain excellence, we need to be in harmony spiritually, mentally and physically. For this, we have to recognize our strengths and our weaknesses, believe in ourselves, think positively, give our best even in the worst circumstances, and learn to acknowledge our mistakes. In our case, our family’s support and the fact they believe in us has helped us on countless occasions, especially when we would reach a point in a project when things weren’t turning out as we had expected. That was when they’d encourage us to continue working on the project. What challenges have you faced in your academic world and in the beginning of your professional lives because you are women and have entered a field that has probably been mostly identified by and for men? Our biggest challenge has been overcoming the machismo which has been evident in certain robotic competitions. We’ve had to prove that as women we are entirely capable of achieving great things. It’s important for women who face great challenges in their lives to believe in themselves. They shouldn’t give up and should continue fighting for their dreams even when they seem unreachable. You are the present, but you are also the future of our nation and our global community. God has given you marvelous talents. What are your dreams and vision for the future? How do you plan to serve your community with your talents? We’re going to continue preparing new projects aimed at helping people. One of our dreams is to study in another country and get a master’s degree in order to share our knowledge and put it into practice so we can contribute to the development of our country. In conclusion, how would you define “excellence” in the daily lives of Verónica and Tatiana with respect to what is public as well as personal and private? Excellence in everyday life means trying to be better persons every day. It’s setting goals, learning new things. It means investigating and designing new projects. In public life, it means solving the problems existing in our society. In our personal lives, it means being better daughters, sisters and friends.